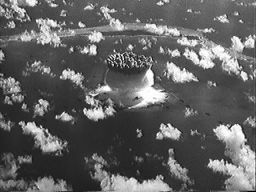 The Crossroads Series tests were the first nuclear explosions since World War II, and the first nuclear weapon tests since Trinity. These were the first "weapons effects" tests ever conducted - tests designed specifically to study how nuclear explosions affect other things - rather than tests of the behavior of a weapon design (as was Trinity). The purpose of the tests was to examine the effects of nuclear explosions on naval vessels, planes, and animals. A fleet of 71 surplus and captured ships anchored in the Bikini Atoll lagoon in the Marshall Islands were used as targets. This fleet included a number of famous Allied and Axis vessels such as the aircraft carrier USS Saratoga, the battleships USS Nevada, Pennsylvania, Arkansas, and New York; the German cruiser Prinz Eugen and Japanese battleshp Nagato. 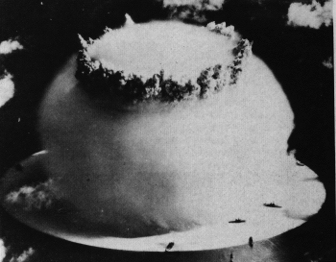 The weapons used were Mk 3A ("Model 1561") Fat Man-type atomic bombs, essentially unmodified from the wartime designs. 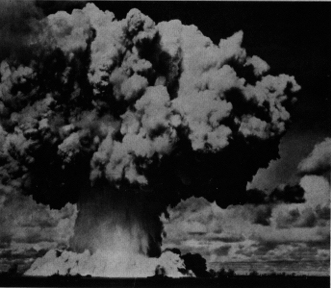 History's fourth atomic explosion. 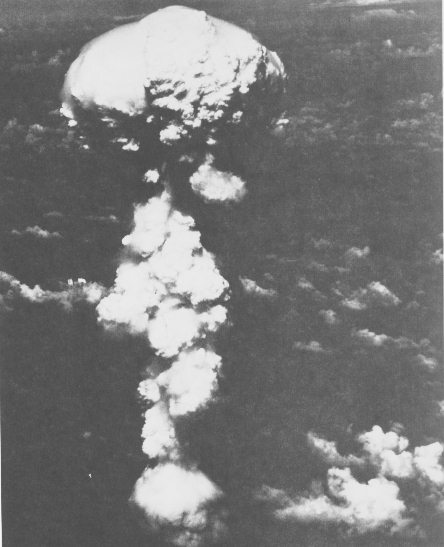 A standard Fat Man type Mk 3A fission bomb, dropped by B-29 "Dave's Dream", was used in test. The bomb fell 980 ft short and 1870 ft left of target, perhaps due to a collapsed tail fin. The USS Gilliam was sunk, and four other vessels were either sunk or severly damaged. The misplaced bomb resulted in a government investigation of the flight crew. History's fifth atomic explosion. 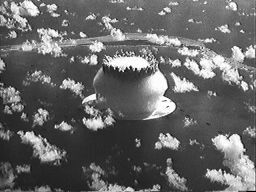 A standard Fat Man type Mk 3A fission bomb was used in test. 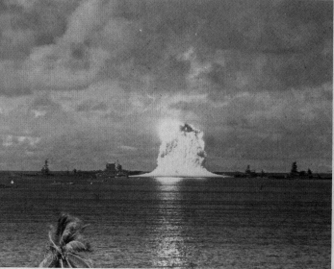 The bomb was encased in a watertight steel caisson, and suspended beneath landing ship LSM-60. 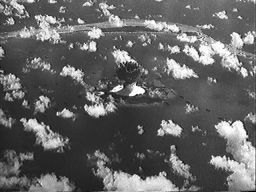 The closest ship to surface zero was the USS Saratoga. Eight ships were sunk or capsized, eight more were severly damaged. Sunk vessels were the USS Saratoga, USS Arkansas, the Nagato, LSM-60 (obviously), the submarines USS Apogon and USS Pilotfish, the concrete dry dock ARDC-13, and the barge YO-160. 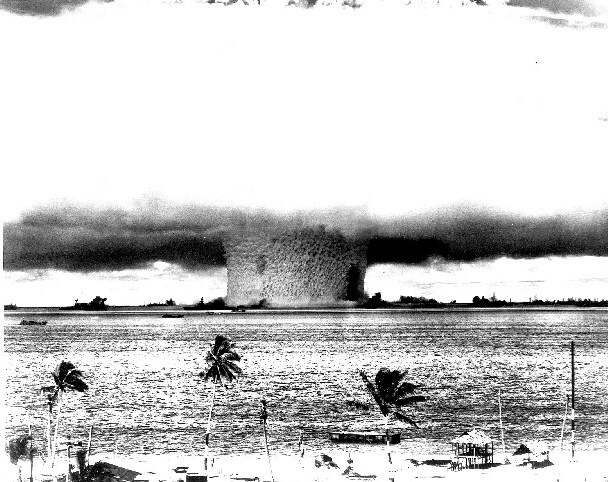 Serious radioactive contamination of the lagoon occurred, radiation exposure at the surface near the detonation point amounted to a lethal 730 R in the first 24 hours. Bikini Island, some three miles from surface zero could not be safely landed on until a week had passed. Beginning 4 milliseconds after the explosion, the shock wave reaching the surface throws up a "spray dome", rising at an initial speed of 2500 ft/sec (mach 2.5), in advance of the rapidly expanding bubble of hot gases. This picture shows the spray dome development a few milliseconds later. 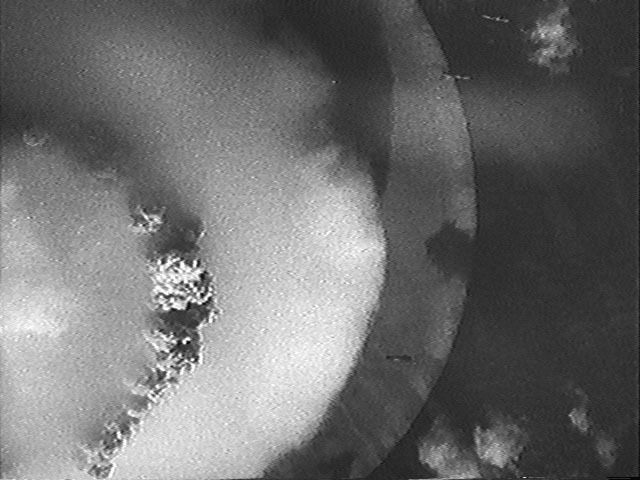 The light from the sub-surface fireball is clearly visible. 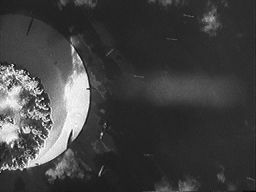 Once the fireball bubble (consisting of water vapor and bomb debris) reaches the surface a huge hollow column of water is thrown up, with the intensely radioactive gas in the bubble being vented through the center of the column. The low pressure rarefaction zone behind the advancing shock wave causes water droplets to condense out of the moisture laden tropical air producing the "Wilson Cloud Chamber" effect. Below, the Wilson condensation cloud is prominent. It hides the growing water column, which is only visible by the "crown" of the column protruding through the top of the cloud. 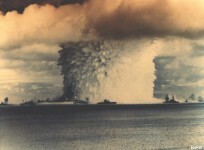 The location of the shock front can be seen by the white zone on the water (called the "crack") surrounding the cloud. The condensation cloud is beginning to dissipate, it has vanished close to the ocean surface revealing the hollow water column (or stem) and target fleet, but leaving a cloud layer that still obscures most of the developing mushroom head. This close-up view of the stem from Eneu Island, 10 seconds after detonation, shows water starting to escape the stem and fall back toward the surface. At its greatest extent, the water column was 2000 feet (600 m) across, with walls 300 feet (100 m) thick, and 6000 feet (2 km) tall, holding a million tons of water. 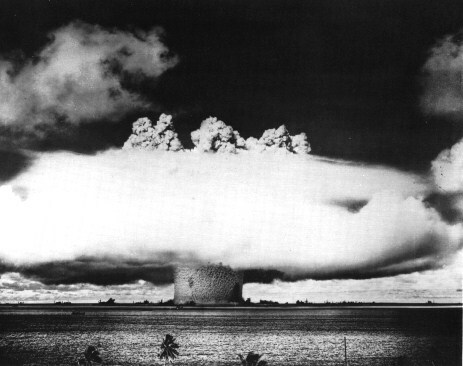 As water falls back from the stem, it forms a dense highly radioactive cloud called the "base surge". Stern of the USS Saratoga can be seen rising 43 feet on the crest of the first wave (94 feet high and 1000 feet from surface zero). Waves 6 feet high were seen 22,000 feet (7 km) from the explosion. 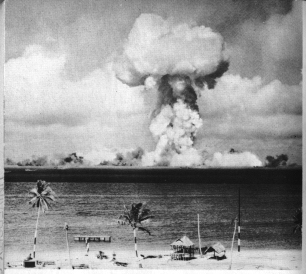 At this point the mushroom cloud head is 6000 feet across (2000 meters). It rose to 10,000 feet (~3000 meters before dispersing). The base surge is prominent. Expanding outward initially at over 60 mph, it rapidly rose to a height of 900 feet (300 meters). 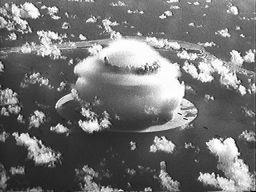 The expanding surge formed a doughnut shaped ring 3.5 miles (5 km) across and 1800 feet high 4 minutes after the explosion. 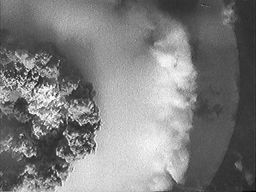 This sequence taken from almost directly overhead provides an excellent view of the formation of the condensation cloud. In the second frame the separation between the shock front (producing the outer slick), and the condensation cloud forming in the rarefaction zone behind the shock front is easily seen. 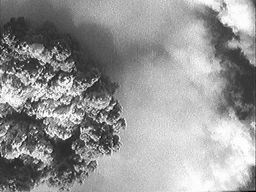 In the first frame of this sequence, the front of the faster moving the hydrostatic shock is visible as a fainter ring surrounding the white slick of the atmospheric shock.